Did you know that there is actually a very distinct difference between the way American’s and Brits use the word “quite”? That difference being that they basically mean the opposite of each other. For example when I say that I quite like something it means that I really like it. When Mike says he quite likes something it means that he thinks something is just ok.
Can you even imagine how many people I have confused over the years talking enthusiastically about something that I’m not too keen on? How many people I have possibly offended by saying that I quite enjoyed x or I quite liked y? Language really is such a funny thing, but then again I would say this since I was an English major. Mike would of course point out that I was an American English major since American English and British English are basically different languages. I must say that I do agree with him to an extent – aside from the slight changes in spelling that you run into on occasion, there are times when it’s like we’re speaking another language. Don’t even get me started on the slang and banter….or should I say cheeky banter? So when I say that this salad is quite delicious, make no mistake that I am using the American interpretation and saying that this salad is a m a z i n g. Ace. Scrummy. Brilliant. New favorite salad right over here. Spicy. Sweet. Healthy. Filling. Everything that I could possibly want in a meal, let alone a salad. 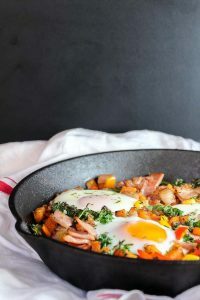 I made a few changes to this one that Heidi from Foodie Crush shared based on what I had available to me. Instead of using butternut squash I opted for sweet potato, used regular pecans over candied ones, dropped the chickpeas (only because I was out), and upped the spice factor on the potatoes to give them more of a kick, and added a handful of dried cranberries just to feel a little more festive. Her tahini dressing works beautifully to mellow out the cayenne on the sweet potato while also adding a touch of nuttiness to the salad as a whole. If you’ve never massaged kale before, don’t be intimidated. 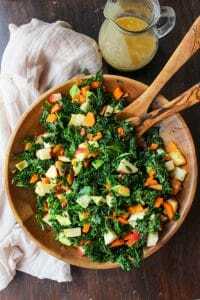 All you have to do is place your washed kale into a bowl, pour a little olive oil over the top and gently rub the kale between your fingers. After a minute or two the previously firm leaves with tenderize. Massaging kale makes it not only easier to digest, but removes some of the bitterness in kale. Plus, your hands will feel all nice and soft after massaging it with oil. With Thanksgiving fast approaching and the mandatory Christmas baking that’s coming up (yes, it’s necessary) this salad is helping me balance out all the treats I’m looking forward to indulging in. I think that’s something we can all understand, no matter what language you may or may not be speaking. 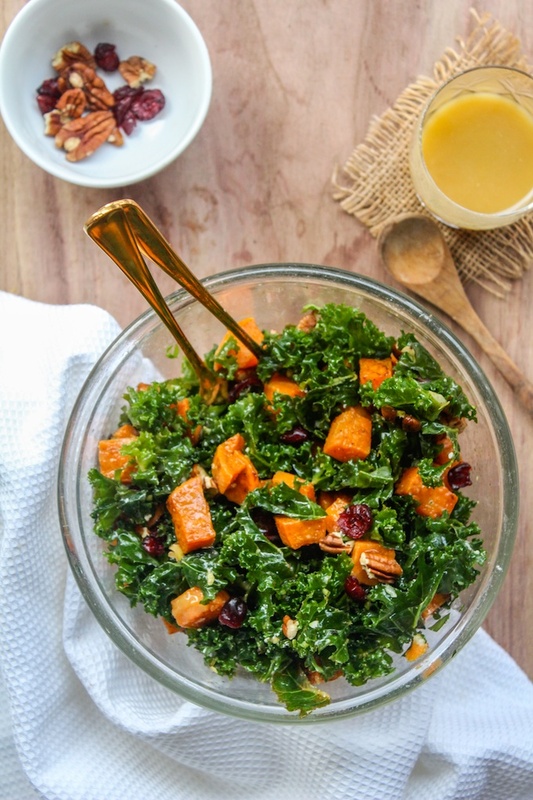 Don’t forget to #asaucykitchen on instagram if you try these sweet potato & kale salad! I love seeing what you make with! You can also post your pictures to our facebook page! Preheat your oven to 400°F/205°C. Add the diced sweet potato to a baking sheet. Drizzle with the remaining 1 tablespoon of olive oil then sprinkle the cumin and cayenne over the top. Mix with your hands until the sweet potato is well coated. Sprinkle with salt and bake for 15-20 minutes or until potato is tender. Moving onto the kale, cut out the tough ribs of the kale and discard. Thinly slice the kale into ribbons and add to a large bowl. Pour 1 tablespoon of extra virgin olive oil over the kale and massage the leaves with your fingers until the leaves become tender and soft. Add the chopped cilantro and toss to combine. Next, add the dressing ingredients to a small jar. Shake to mix and taste for more seasoning if desired. 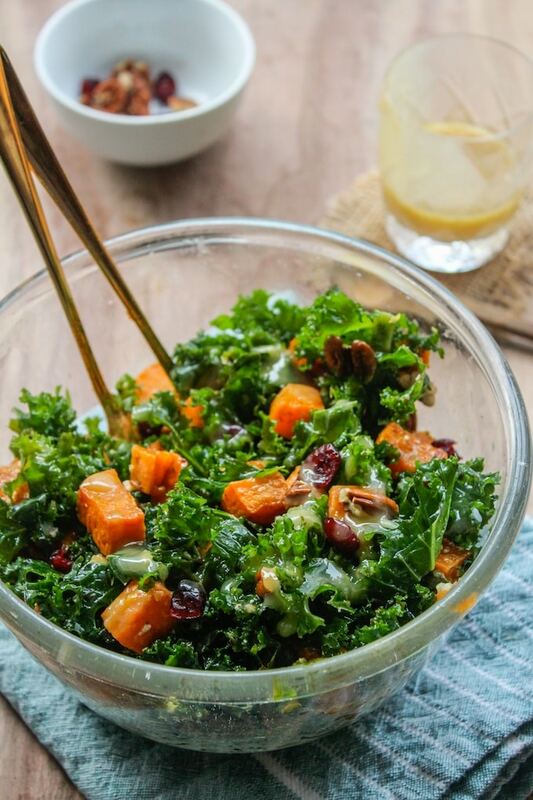 Transfer the sweet potato to the bowl of kale. Add the pecans and dried cranberries and drizzle with the tahini dressing. Thanks Sunita! And yes it is maple syrup! 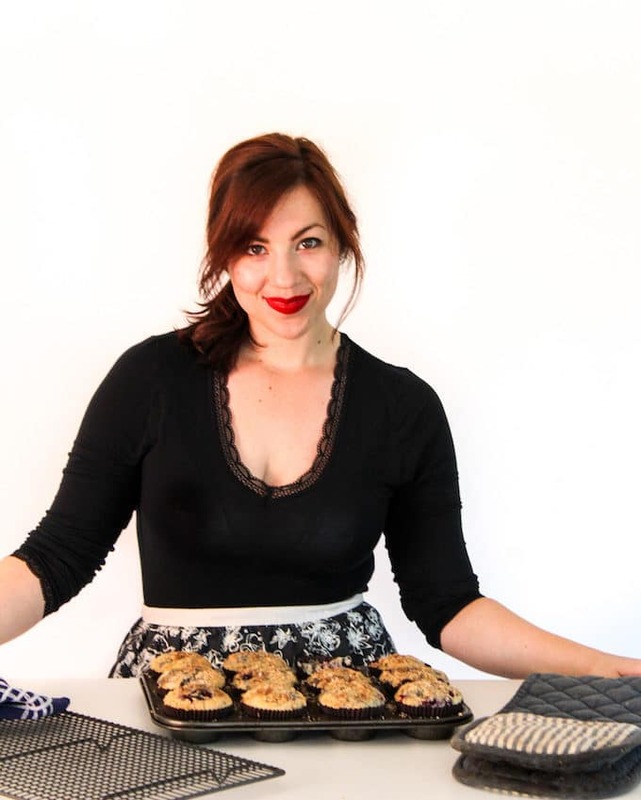 Thanks so much for sharing this with us over at Savoring Saturdays! Hope you’ll join us again. Pinned. Have a great weekend! haha… Loved reading about the English confusion. We follow Brit English too…so when I say I “quite” love the post, I mean I really like your post..and your blog!! gorgeous food as always! Pinning… and thanks so much for joining us at #SaucySaturdays! Haha, thank you! Don’t you just love language?! Definitely keeping this in mind for when my garden overflows with kale (it’s pretty much the only thing I can grow!). Thanks so much for sharing it at Savoring Saturdays! Your salad looks delicious. 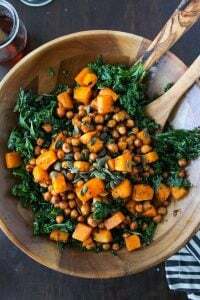 It seems like the texture of the sweet potatoes, roasted and tender with the kale would be good. You could even lightly roast the Kale just before serving. I chuckled when I read your “quite” problem. I attended an international school for a year when I was growing-up and when I returned to the US I got teased in school for saying quite the British way. I eventually change my use of quite back to the US version… peer pressure… But for today, in your case, this salad looks quite good!!! This looks delicious! 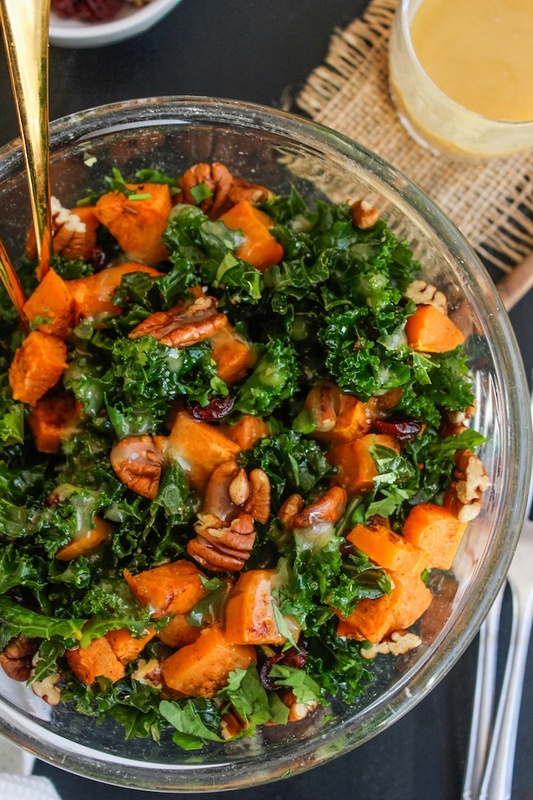 I love sweet potatoes + kale, yum! Pinning and sharing.